On a sunny summer Wednesday, light rail trains roll past the Skidmore fountain in downtown Portland. 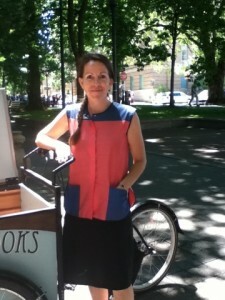 Twice a week this summer, Portland artist and writer Laura Moulton has hopped on her decked-out Haley tricycle and headed to downtown Portland. What makes her bike special is that it’s a mobile library. A large pullout drawer is filled with hundreds of books. 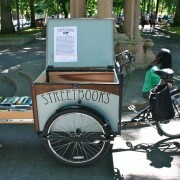 Moulton calls the project Street Books. Most of Moulton’s patrons are homeless and might not ordinarily enter a public library. Street Books gives patrons a chance to briefly escape a tough living situation. But even more than that, Street Books sets the stage for interactions that crosses socio-economic boundaries. Producer Tali Singer with Dmae Roberts takes us to Street Books with an audio collage. You can hear the whole Stage & Studio show here. Be sure to check out the Street Books website, where Laura Moulton posts regular updates about her patrons. 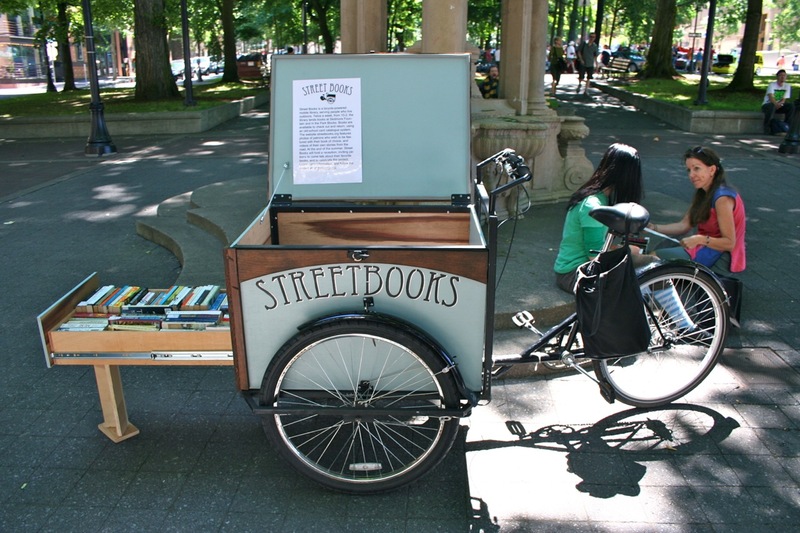 You can also make a donation, or stay up-to-date on the latest Street Books news. Moulton plans to continue Street Books through the fall and winter. Tali Singer has worked as an intern with Dmae Roberts since 2008. She’s now a senior at Brandeis University where she’s majoring in linguistics. After graduating, she plans to pursue a career in public radio. This edition of Stage & Studio is Pushing Boundaries special made possible with funding from the Regional Arts & Culture Council. Pushing Boundaries is a year-long series that explores artists and arts groups pushing physical, emotional and artistic boundaries in their work. You can hear Stage & Studio live at the KBOO.FM or on 90.7FM live at 11am Tuesdays. Or you can subscribe to the podcast on iTunes so you don’t have to miss a show. Or subscribe to our iTunes feed!